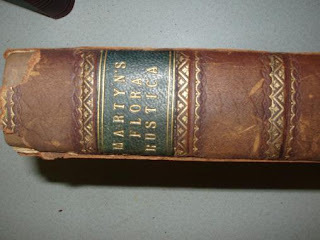 Flora Rustica, from the library of Charles Haddon Spurgeon. 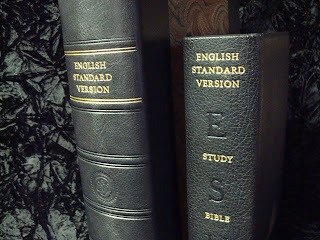 This is a good example of the rebacking of a 19th century half-calf volume. 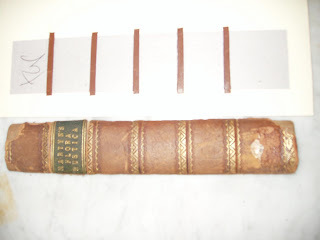 The boards were detached and portions of the spine were missing. 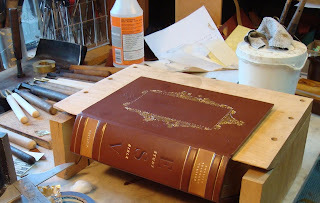 Sometimes (particularly with ornately tooled family Bibles or important publisher's cloth bindings) we'll insert new material under the original and put the old spine right back on. On other occasions, replacing the aged leather is more appropriate. 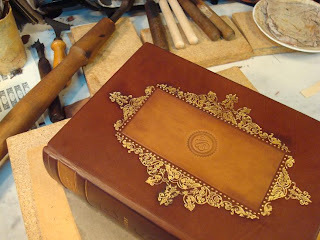 This time, we built new boards with new leather corners and spine, used the original cloth sides and leather spine label, and then tooled the new leather to match the old. 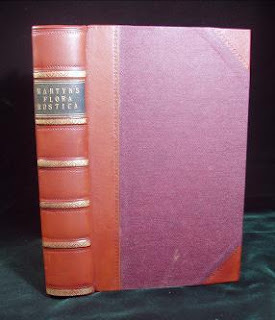 The result is a book that looks very much like an immaculately preserved original. 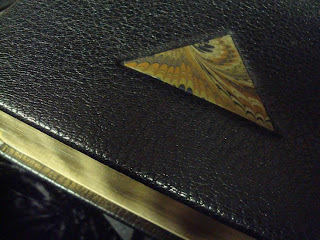 Spurgeon's bookplate was, of course, carefully lifted from the original pastedown and reattached. 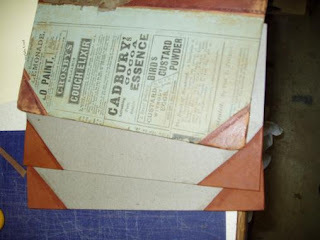 Of interest to some may be the scrap paper the last binder used to line his boards underneath the cloth. 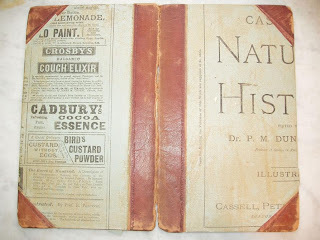 They are the paper covers (wraps) and ads from another natural history volume. I'll often use scrap paper from our printer tray. which I'm sure will make interesting reading for someone in 2110. 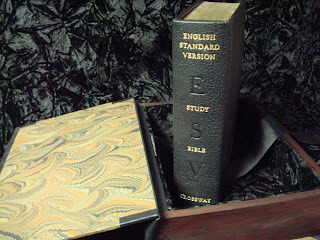 This ESV Study Bible was commissioned by the publishers. Created as a presentation piece, the goal was simply to use elements of the published design (top photo) while creating something exquisite. 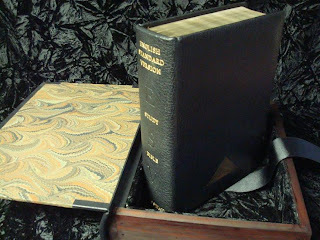 It arrived as an uncovered textblock and was bound in heavily grained morocco with beveled and rounded boards, double-core headband in three colors, leather inner joints, and hand marbled endpapers. 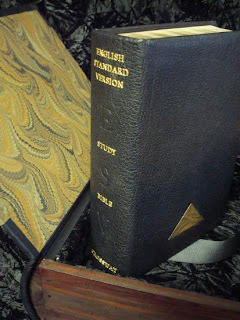 The lettering design of the spine was taken from the original, as was the use of the triangle as a design element. 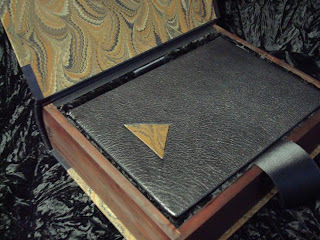 A marbled triangle is inlaid into the front cover , recessed below the leather, and the triangle theme is repeated in the gold tooling around the inner dentelles. 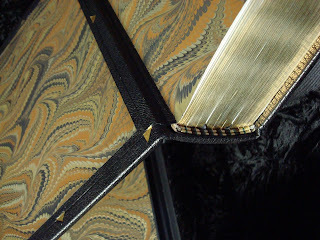 A velvet-lined box was built to house the book and uses black morocco, wooden sides, and matching marbled paper. 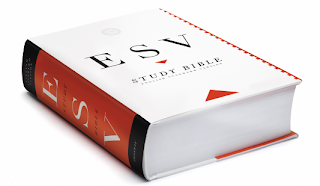 The publisher's logo is worked into its rounded spine. 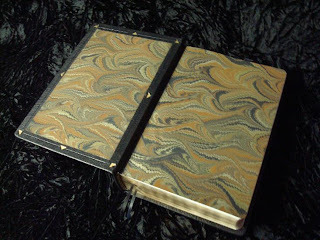 Several photos of a second copy commissioned at the same time follow.